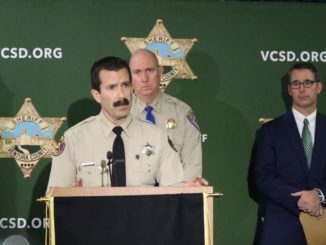 (Ventura, Ca) On a day where the Center for Disease Control (CDC) announced that overdose deaths in 2017 had grown to 72,000, the Ventura County Deputy’s Sheriff’s Office shared an announcement that the Ventura County Narcotics Task Force concluded a four month long investigation resulting in the arrests of 12 individuals and the dismantling of a major heroin network that likely impacted the sales from 200 to as many as 1,000 buyers of the narcotic, according to detectives. 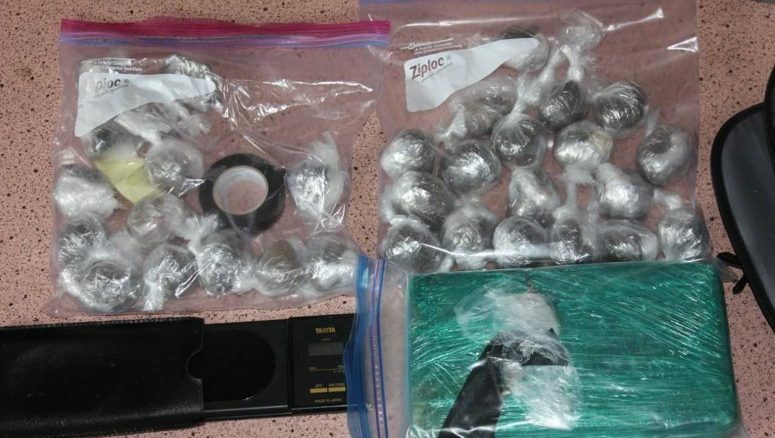 The group, also known as the Chaidez-Gonzalez crime family, was found to be supplying heroin delivery services, as well as individual dealers, with bulk quantities of product for resale. The heroin in this network came from Mexico, the largest market by far sending heroin into the United States. Heroin is part of the opioid family of drugs, which includes painkillers like Oxycontin, the most widely abused painkiller. Painkillers often become the gateway drug leading to the use of heroin, an illicit form of opioid. 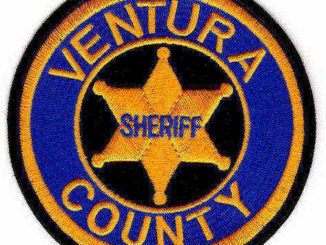 Earlier this year, Ventura County joined other governments suing Purdue Pharmaceuticals, the maker of Oxycontin, for the deceptive sales practices involved in the distribution and sale of the drug. Just days ago President Trump asked Attorney General Jeff Sessions to bring federal lawsuit, separate from state and local litigation against drugmakers. On October 26, 2017, President Trump announced that his Administration was declaring the opioid crisis a national Public Health Emergency under federal law. On March 19, 2018, the President unveiled a new website, CrisisNextDoor.gov, where Americans can share their own stories about the dangers of opioid addiction. According to the website, in 2018, 2 million Americans will suffer from addiction to illicit or prescription opioids. Data shared by the Ventura County Health Agency shows that about 25% of all deaths in Ventura County are due to drug overdoses. Data provided to The Voice La Voz includes charts that detail the challenge, city by city. One of the only means to determine opioid addiction is in tracking the use of Naloxone, also known as Narcan. Naloxone is a medication designed to rapidly reverse opioid overdose and is administered by medical professionals. It is an opioid antagonist—meaning that it binds to opioid receptors and can reverse and block the effects of other opioids. It can very quickly restore normal respiration to a person whose breathing has slowed or stopped as a result of overdosing with heroin or prescription opioid pain medications. Narcan use is tracked and can help gain insight as to the demographics patterns of addiction. 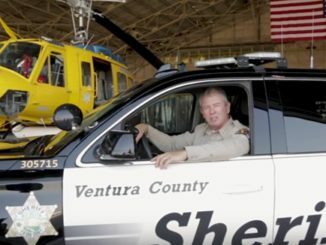 According to Figure 1, every single city in Ventura County is impacted by opioid addiction. 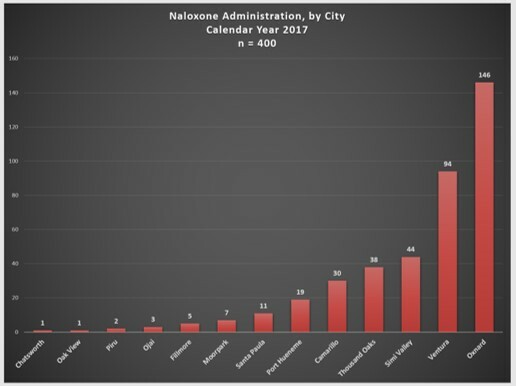 By far the city that is the most impacted is Oxnard with nearly 25% of the county’s Narcan use. The Drug Enforcement Agency, the body tasked with enforcing substance laws and regulations, has identified Mexican Transnational Crime Organization or “TCOs” as a key source of heroin trafficking in the United States. 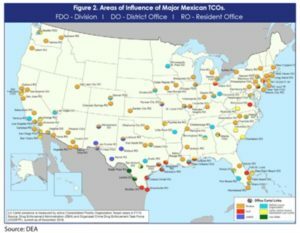 Mexican TCO’s remain the greatest criminal drug threat to the United States and while TCO’s from other regions exist, no other group is currently positioned to challenge the Mexican TCO’s. They maintain territorial influence over large regions in Mexico used for the cultivation, production, importation, and transportation of illicit drugs. Figure 2: Mexican TCOs maintain the greatest drug trafficking influence in the United States, with continued signs of growth and expansion. Spheres of Influence continue to expand in the US. In spring 2018, Congress added an additional $500 million to the National Institute of Health (NIH) budget to invest in science to find solutions to the opioid crisis. Several projects across NIH include ones focused on two main areas: improving opioid addiction treatments and enhancing pain management to prevent addiction and overdose. The funding that the National Institute of Drug Abuse, or NIDA, is receiving will go toward the goal of addressing addiction in new ways and better delivering existing forms of care to populations that need it. To put that into context, that would make it the 8th leading cause of death in the U.S., just behind diabetes and a little ahead of deaths caused by the flu, kidney disease, and suicide. Don’t Miss The Pet Adoption Event OF. THE. YEAR. Thank you Angela for crafting this timely, well-researched, sourced, and written, but sobering yet vitally important news story for Oxnard, Ventura County, California, and indeed the entire United States of America. And the facts and evidence here are as unmistakably clear as they are empirically irrefutable. Like any market, the market for opioid drugs is ruthlessly ruled by the Queen of Demand, who magnetically attracts multiple Dukes of Disaster, that control and feed off the opioid supply chain. The demand facts are crystal clear. Over 2 Million Americans suffer addiction to illicit or prescription opioids nationwide. 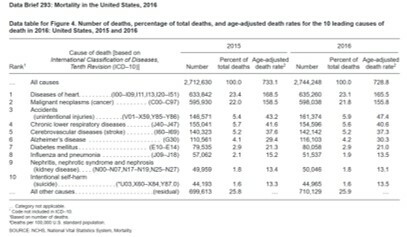 And in Ventura County, data from the County Health Care Agency reports that today 25%, or 1 out of every 4 people, who die in Ventura County do so from drug overdoses. The supply chain facts are even more ominously clear. Mexican Transnational Crime Organization or “TCOs” are a key source of heroin trafficking in the United States. Mexican TCO’s, in particular the Chaidez-Gonzalez Crime Family, remain the greatest criminal drug threat to the United States and while TCO’s from other regions exist, no other group is currently positioned to challenge the Mexican TCO’s. And American Big Pharma, particularly Purdue Pharmaceuticals, the maker of OxyContin, are now facing long-overdue lawsuits from local, state and now the Federal government, for deceptive sales practices involving the irrationally exuberant distribution and sale of the drug. Opioid addition is THE existential challenge to the public health, safety and welfare of the citizens of Oxnard, Ventura County, California and the United States. How the American body politic, both those in government, and those outside of government, choose to recognize, combat, and defeat this opioid challenge, remains an open but vital existential question. And the answer to that question will, in great measure, determine whether the country’s future is safe, democratic, and prosperous, or dystopian, dysfunctional, and dictatorial.